Monteverde is a beautiful and unique cloud forest destination which is excellent for birdwatchers. You can use the map below to find hotels, restaurants, and various points of interests. This map was provided to us by our friends at Toucan Maps Inc, Costa Rica Guide. 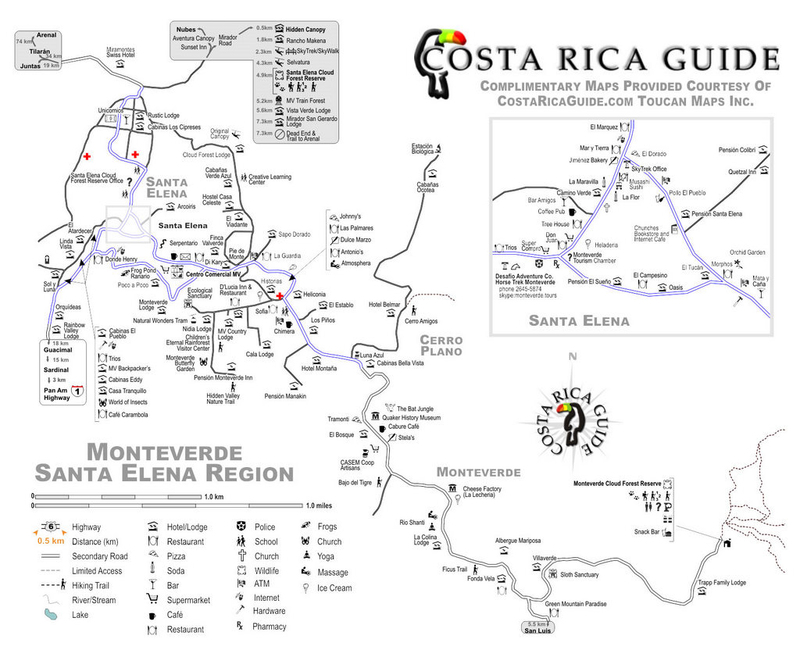 We encourage you to visit their website for the printable pdf version of this map of Monteverde as well as many other destinations in Costa Rica. Click here to view the full size map of Monteverde. The following map of Monteverde is an interactive map using the latest Google technology. Zoom in or out or pan left, right, up or down with the controls on the left. Latitude: N 10° 18' 56.75". Longitude: E 84° 49' 6.34"